As far as season finales go, Scorpion somehow managed to pull off one the most fun and non-stressful finales I have ever seen. It fits perfectly with this season’s mood of light, fun, and action-packed, while maintaining the strong relationships, friendships and character growth arcs. It’s been three weeks and the team is still stranded on the island. Tensions are growing, relationships are being tested, and hope is slowly slipping away. The episode is told through Sylvester’s journal entry, and the usually bubbly math genius is the first one to start cracking. Fatalistic, cynical Sly has moved into the bunker they found, befriended a lizard, and has accepted their fate. As we see the team’s adventure through his narration, it becomes clear that the lesson here is that the only thing that can break this solid team — this family — is them. The team is on the edge of sanity, getting on each other’s nerves and quickly running out of supplies and any hope of rescue. The two couples on the island are also frustrated. Toby and Happy just got married and this was supposed to be their honeymoon. Walter and Paige just confessed their love for each other and this was supposed to be the beginning of something they have awaited for so long. But unfortunately for everyone, none of that is happening, and while they do try to maintain some sort of civilization — with Ralph continuing his lessons and Cabe insisting on shaving — there is nothing normal about their situation. Paige even goes as far as telling Walter to forget everything she has taught him and let his EQ drop and take charge of the situation. As a last attempt to secure rescue before monsoon season, Toby suggests, once again, that they build another raft and send it out to try to make contact with someone. However, Walter has a different idea: His plan is to create a magnetic shift strong enough that it would alert one of the research stations that monitor magnetic activity. The team gets into an argument and splits up. Cabe, Paige, and Ralph side with Toby while Happy and Scotty — the pilot — go with Walter. This move does not only break up the team, but it breaks up the couples, and so the struggle and rift begins. As both teams work hastily in a race against time, they find themselves having to face each other again when they arrive at the bunker in search of the one radio which they both need for their plans to work. But with Hagrid — the new nickname they give to a now heavily-bearded Sylvester — guarding the bunker and the radio, the divided team must once again face off. Sylvester makes a deal with them: Both men need to present their case to him and he will decide who is more deserving of the radio. But even after that, Sylvester refuses to give up the radio because he proves that both teams had been cheating. Happy had been assisting Toby behind Walter’s back and Paige had been helping Walter behind Toby’s. And as tensions again begin to rise, Walter goes to an EQ extreme and threatens to eat Sylvester’s lizard if he does not give him the radio. Sylvester finally relents and takes the other to where he had hidden the radio, but it is not where he left it. The team realizes that Ralph is missing and that he had taken the radio. Walter and Happy soon figure out what he plans to do and how dangerous it is. They reach the beach just in time, barely, but Scotty manages to save Ralph from an explosion. Luckily they do manage to get the attention of a monitoring station that sends a small aircraft. And the team quickly work together to build a “neon light” bright enough for the plane to see. 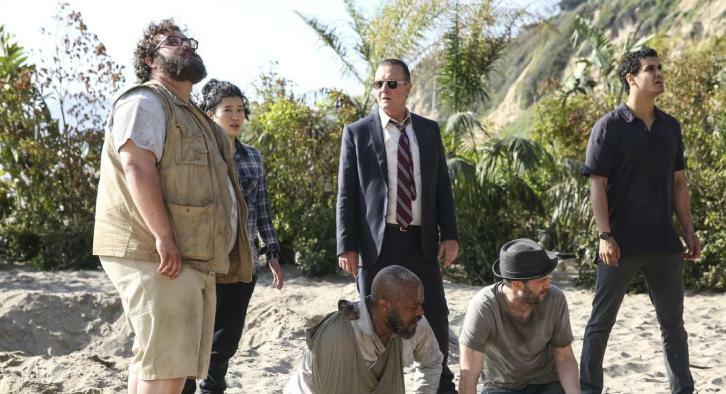 And team Scorpion is rescued. The team is back at the garage, and after a brief moment of teasing when they find a video or Happy’s Portuguese pop single, they all go their separate ways to celebrate being alive. Cabe goes to meet Allie, Happy and Toby go to officially start their honeymoon, Sylvester has Alderman duties to attend to, and he takes Ralph with him to allow Walter and Paige to finally get their moment together. The finale was action-packed, funny, and light, compared to previous finales and compared to what season finales usually like to do to viewers — and I absolutely loved that. It is a nice change from the traditional formula and proof that not everything needs to be too angsty or to end with a cliffhanger to make the viewers happy or to keep them looking forward to the next season. I really appreciate what they did there and I think it was courageous and clever. And I think it sets up the next season really well. The team is established and stronger than ever, and everyone is embarking on new journeys. Sylvester is now Alderman, Cabe is with Allie, Toby and Happy and married and Walter and Paige are finally moving forward in their relationship. All this sets up a new season with very interesting new character arcs and team dynamics.